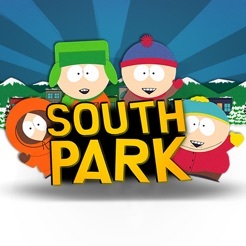 - The official South Park app! - Watch full episodes and entire seasons for free! - Download it for free and start watching now! Do you sometimes watch South Park on the sly during a meeting or class projects? 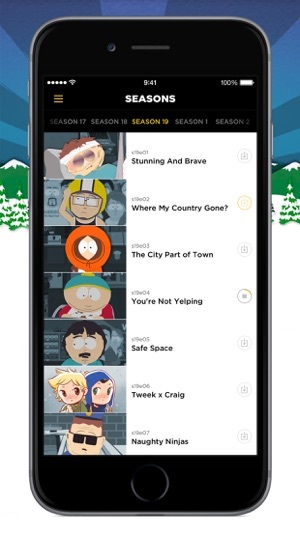 With the South Park app, you can now stream and watch your favorite episodes featuring Stan, Kyle, Cartman, and Kenny from anywhere and at any time. All episodes and seasons are available in the English original, and many episodes are also available in German, Dutch, French and Polish. You can easily change the language (English, German, Dutch, French and Polish) of the episodes and videos in the app's settings. » Gorge yourself on episodes from the South Park archive, which currently contains 19 seasons and over 250 episodes! » With the subscription you can disable all the advertisment in the app. 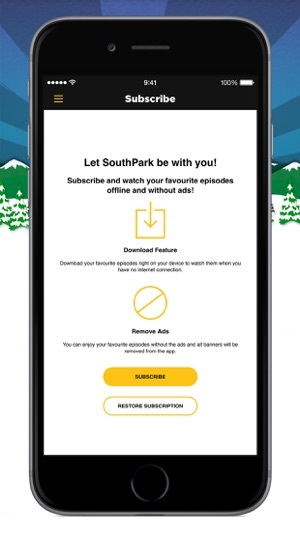 » The subscription also allows you to download your favourite episodes so you can watch them offline and on the go! » Search for certain episodes by browsing through the seasons or use the search function. » Can't decide which episode to watch? Click the "Random" button and the app will play one for you at random! » Check out the latest and most popular episodes! » Show your friends what they're missing and share your favorite episodes on Facebook, Twitter, or directly via e-mail! 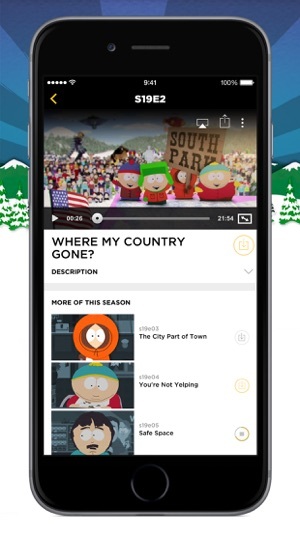 » The South Park app is financed via ads and is 100% free for you! » The app can be used in the following countries: Germany, Austria, Switzerland, Netherlands, Belgium, Luxembourg, Sweden, Denmark and Poland. » Depending on the country in which you're currently located, new episodes and videos will be available immediately after being broadcast on TV. » The app is optimized for the iPhone, iPad ad iPod touch, and works best on iOS9. iOS8 continues to be supported for all devices. 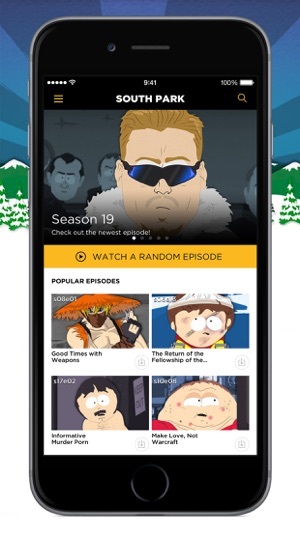 Unlike Netflix, Maxdome, Watchever, Zattoo, 7TV, Magine TV, MyVideo, Youtube, FilmOn, ProSieben, Schöner Fernsehen, TV-Spielfilm, Clipfish, Lovefilm and dailyme TV, the South Park app is the only one to offer all South Park episodes, videos, and seasons! ISN'T THAT F***ING AWESOME?! » If you find the app cool, awesome or even terrific, we would be glad to receive a positive rating, your feedback, or your comments in the app store! You asked for it and now you get it! Download and watch videos offline and disable ads with our all new subscription - over 3G/LTE! Download it for free and start watching now! I’am paying for wathing without commercials and it’s ok. But why last season in Poland is 19 ??? Season 11 don’t have even polish subtitles and some episodes in season 6 and 8 haven’t got it too. Please fix it and add episodes 20 and 21. Only works over wifi, doesn't work over my LTE connection.